It’s been a month now for your blogger in Tajikistan – hard to believe it, seems like only yesterday I was paying $14.99 for a sandwich in the Toronto Pearson airport. Most of the culture shock is past (see here for a graphic illustration – don’t ask me what the “Fantasia” period involves), I’m getting into a regular exercise routine, and gradually building a social network among colleagues and other expats in Dushanbe (there aren’t many of them). Hey, even my Russian is slowly improving, so life is alright. My work with NPA is also getting quite interesting. One of my projects here is being involved in a Dialogue Process on the nationalization of the Tajikistan Mine Action Centre (TMAC), the agency charged with overall responsibility for all demining, victim assistance, mine risk education, and other mine action activities in the country. The problem is that after years of trying to turn over ownership of the agency to the Tajik Government, it is still being run as a de-facto project of the UNDP, which administers the budget, pays staff salaries, etc. Entrenched interests and bureaucratic inertia have kept this status quo intact, but the writing is on the wall and donors have lost patience. To break through the impasse, an external conflict resolution / mediation NGO has been brought in an attempt to a facilitate dialogue among national stakeholders and, ideally, deliver a realistic action plan for nationalization. The whole business strikes me as symbolic of the larger problem of local ownership of externally funded nation-building, a topic which I find endlessly fascinating. Try not to introduce yourself as “the intern.” This might be out of your control, either because you are involuntarily introduced this way by others, or because, well, you’re job title is actually an intern. But if you can help it, use your real job title (project officer, program assistant, coordinator, whatever). In my experience, people often associate the label of “intern” with an undergrad student or a volunteer, rather than an early-career professional with valuable skills and experience. It’s probably not a huge deal, but it might change others perceptions of you in ways that aren’t helpful. Just because you’re working somewhere for a short period of time (say, less than 12 months) doesn’t mean you have to sell yourself short. Volunteer to be involved in everything, everywhere, all the time. No better way to make the most of your time, learn about your host organization’s work, and find the best way to contribute. Not everything will turn out to be as interesting as you thought it would be, but you’ll never know until you try. Let’s face it, as a twenty or even thirty-something year-old, you’ve still got a lot to learn, and your skills probably aren’t so specialized yet that you can’t try to branch out. Of course, you don’t want to spread yourself too thin and lose focus on your key tasks, so use your judgement. Do your homework before you go. Everyone wants to make a good first impression on their new colleagues, as well as the other interesting people you’re likely to meet in the capital city of a developing country. It’s harder to do this if you lack some fundamental background knowledge of the country you’re working in (“Oh, you mean there was a civil war here five years ago? Between who?”). At a bare minimum, familiarize yourself with the names of key political or public figures that are likely to be mentioned in conversation, have a rough idea of the country’s main geographic areas, and get comfortable with any acronyms that are likely to be used in your line of work. Hopefully, you will seem less totally clueless when you bump into the British Ambassador in line for a beer at a public reception. Learn the market rate for everyday expenses, such as transportation, and insist on receiving it. This is often difficult when you’re new to the country, don’t have a strong grasp of the local language, or (like a lot of Canadians) feel uncomfortable haggling. But if you’re on your first overseas work placement, chances are you’re not rolling in it, and it’s important to keep track of your finances and avoid being chronically ripped off. Besides, no one likes feeling like a sucker every day. Accept that everyone you meet will ask you if you know their friend / relative / distant acquaintance in Canada. “Oh, they lived in Toronto four years ago? You don’t say…” Don’t fight it, there’s nothing you can do. That’s it for now – I’m sure there will be much more to add to this list before I’m through here. What are your experiences and tips for managing life while working abroad? 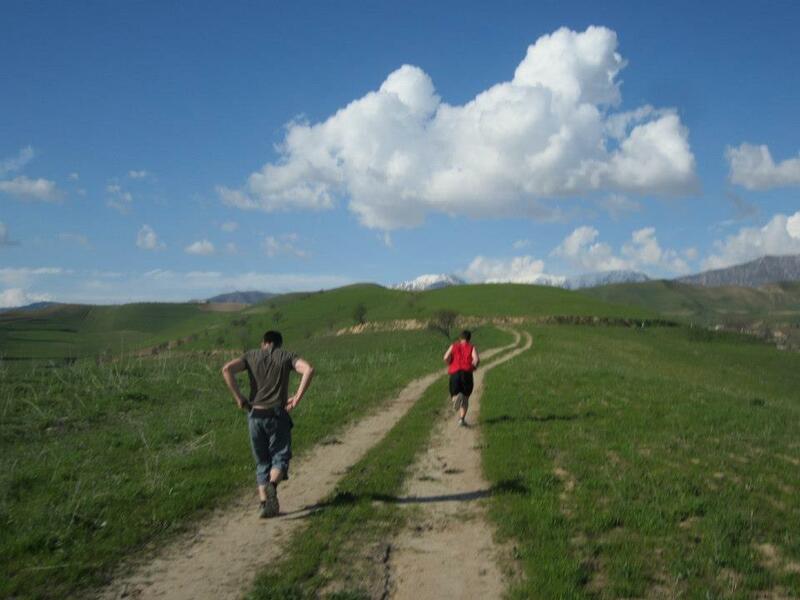 Last week’s Hash run outside Dushanbe. 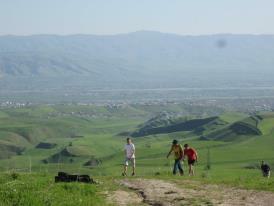 Spring in Dushanbe, not hard to look at.